Someone give Atlanta Movie Tours a Tony Award, please! Seriously. 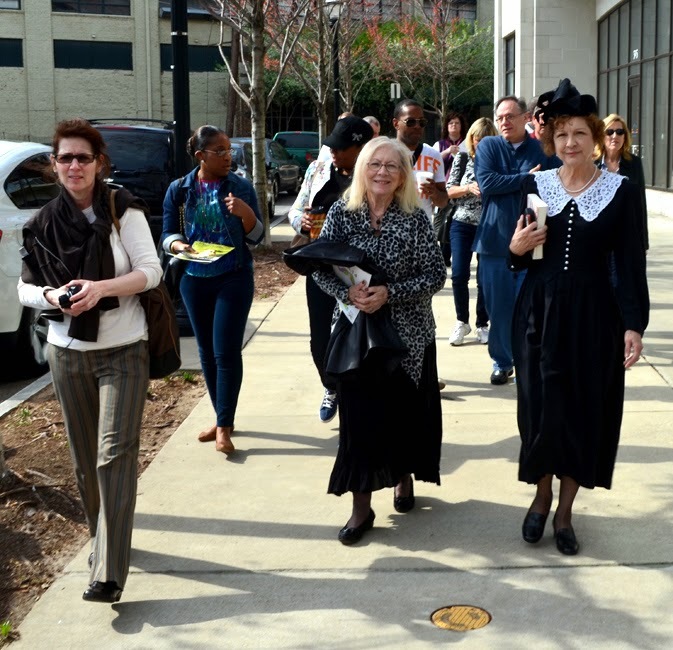 The new Margaret Mitchell's Gone With the Wind Tour presented by Atlanta Movie Tours is indeed award worthy! Words fail me as I try to describe just how exceptional. This was a tour—and I've been on a LOT of tours—that immediately mesmerized me, sustained my attention, and was without question three hours of abundant fun! You know that feeling when you're watching a movie and you're so invested in it that you never realize that you've been watching as long as you have? And you don't want it to end when you do? That's this tour! Led by none other than 'Margaret Mitchell' herself, she discusses her book at length, as well as shares insights into her life in a manner that only Margaret could. The presentation, indeed the performance, is presented though the eyes of Margaret Mitchell. On the way to the Margaret Mitchell House, we drove by the Wimbish House. Owned by the Atlanta Woman's Club, today it's a special events venue. Margaret Mitchell was born at Grady Hospital and that's where she passed away five days after being struck by a an off-duty taxi driver near Wimbish House. Today, Wimbish House is the site of many wonderful memories. I never once saw "Margaret" reading from a script and never felt like she was spewing out memorized script. I caught myself so into the performance that when I had questions, I prefaced them with, "Ms. Mitchell, ..."
While Margaret reminisced on her charitable work (photo above), our Margaret Mitchell House tour guide, Ann, regaled us with stories of Margaret and husband John Marsh's time at "The Dump", what they called their apartment at Peachtree Street and 10th Street. You'll learn more about 'why' they called it that on the tour. I've toured The Dump before, but doing so with media professionals on an Atlanta Movie Tours event was a unique experience. One perk was that as media, we were permitted to make photographs in the apartment—a 'no-no' on the standard tour. I'm not sure why, but perhaps it's because none of the furnishings in the apartment are original to Margaret and John's living there and they don't want Margaret's life misrepresented? 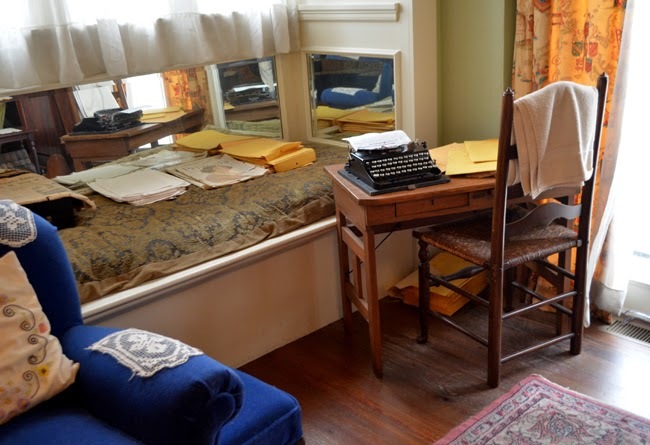 Even with that, it's fun to imagine Margaret writing at least a little of Gone With the Wind under the window where they've placed the small desk (above photo). It's beyond cool to visit Margaret Mitchell's home, where she spent a number of years writing Gone With the Wind. The Making of a Film Legend: Gone With the Wind is a definite a must-see. This exhibition is housed in an adjacent building, a mere few steps from the Margaret Mitchell House. A couple of my personal favorite highlights of The Making of a Film Legend include the original door from the Tara facade used in the movie, as well as the original portrait of Scarlett (above photo) used in the movie. On the way to Oakland Historic Cemetery, we passed by The Georgian Terrace, directly across the street from The Fox Theatre. Before I go on...no, Gone With the Wind did not premier at the Fox, but the film's stars stayed there during the premiere. I remember years ago that there was a Gone With the Wind exhibit on the lower level of The Georgian Terrace. I understand that that collection is now mostly displayed at the Road to Tara Museum. 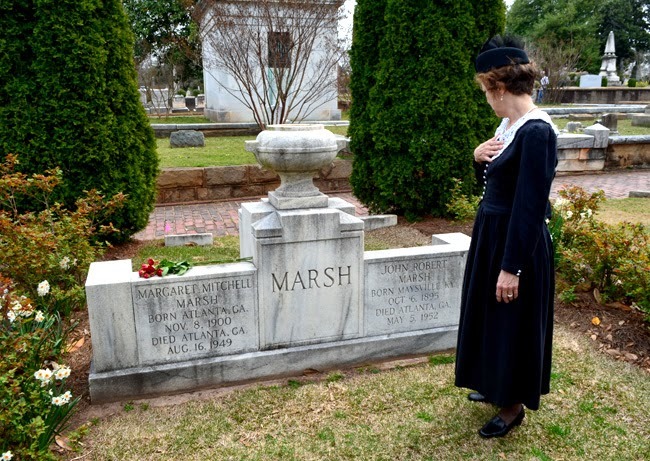 I've read that Margaret Mitchell's final resting place in Historic Oakland Cemetery, which I've written about before, is the most visited grave in the "garden cemetery" that started with a mere six acres. When you visit Margaret's gravesite, note that she and husband John are on one side, the Marsh side, and her parents were interred on the opposite side of the same gravestone, the Mitchell side. 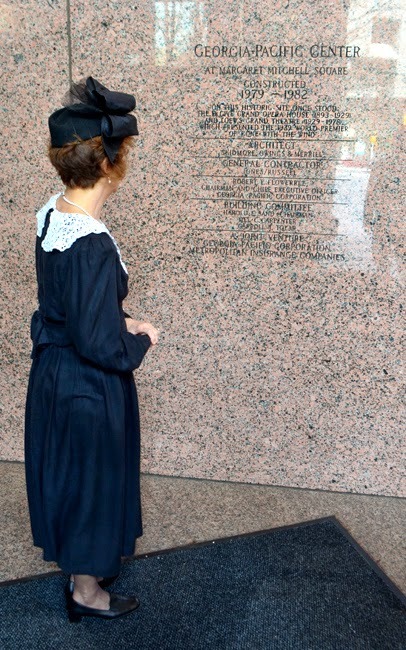 I love this photo (above) of "Margaret" having a 'moment' while reflecting on the life of the real Margaret Mitchell. The photo was not staged...it's total serendipity. This was also the site where we made our Atlanta Movie Tours group photo. We stopped by the Georgia-Pacific Tower, Atlanta's sixth tallest skyscraper, which is where the Loew's Grand Theatre once stood—where Gone With the Wind premiered. I recently saw some fantastic rare color video, courtesy of the Atlanta History Center, of the Gone With the Wind premiere events. A not-so-well-known factoid: While the Loew's Grand was lost to fire in the 70s, its bricks were used to build the Houston's Restaurant on Peachtree Street in Buckhead. You won't find much on their website, but you will find a small brass plaque just inside the entrance marking their Gone With the Wind distinction. 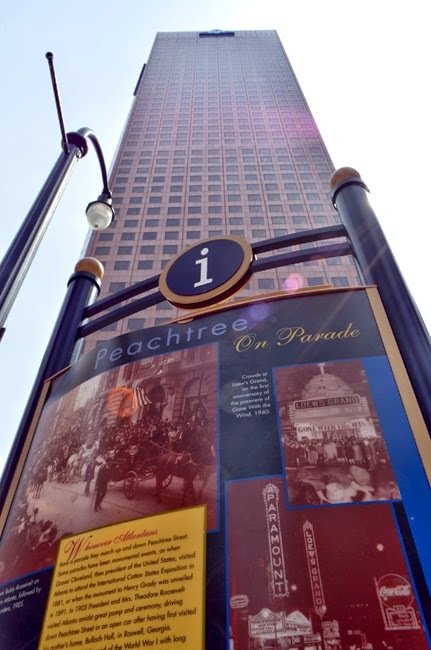 There's an engraving on the exterior of the Georgia-Pacific Tower that includes a brief acknowledgement of it being the site of where Gone With the Wind premiered. The majority of the engraving notes the design and construction of the skyscraper. I have a confession. It was only in the last few years that I watched Gone With the Wind in its entirety. 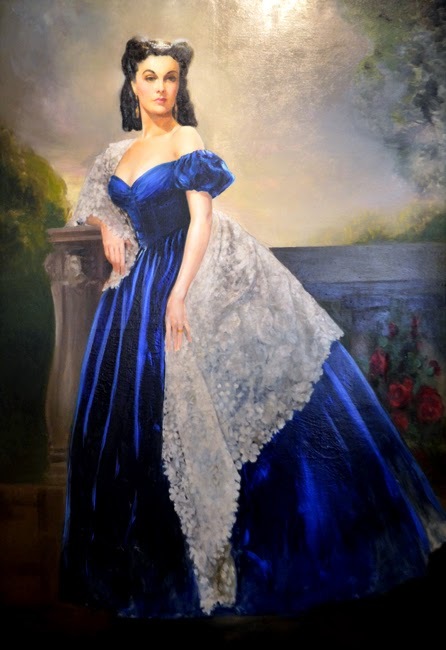 I know, I know...how can I call myself a true Southerner if I've not seen Gone With the Wind. To compound matters, I've not yet read Gone With the Wind. But rest assured, it's at the top of my reading list. Authoring wanderlust ATLANTA I've enjoyed the opportunity to learn quite the volume of information about Gone With the Wind and Margaret Mitchell, steadily increasing my fandom of both. So, when I do read the novel—in the near-term—I'm guessing it'll be like listening to an old friend regale the more fascinating accounts of her life. Perks of the Tour: You'll not only be offered bottled water—hydration is important on any tour—but they'll also hold a trivia session...with prizes! And you'll receive a complimentary digital copy of your group photo...smile! AND you get admission to the Marietta Gone With the Wind Museum and the Road to Tara Museum. I told you this is a fun tour. Our next stop was the Central Library located at One Margaret Mitchell Square in Downtown Atlanta, across the street from the Georgia-Pacific Tower, former site of the Loew's Grand Theatre where Gone With the Wind premiered in 1939. Central Library, part of the Atlanta-Fulton Public Library System, is home of the quite special Margaret Mitchell Exhibit. 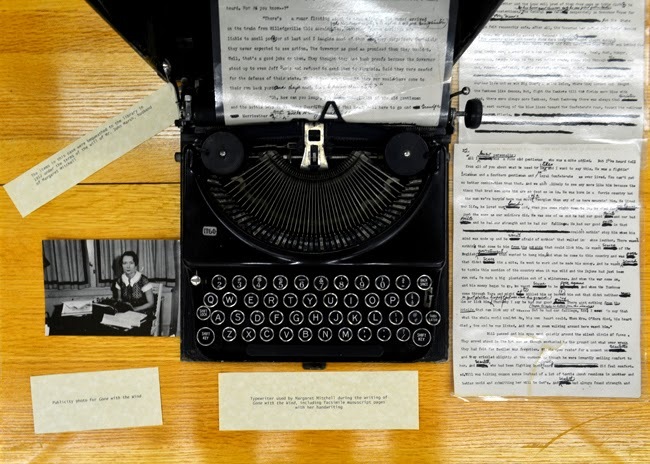 Here you'll see the actual typewriter that Margaret used to write Gone With the Wind...and a lot more. 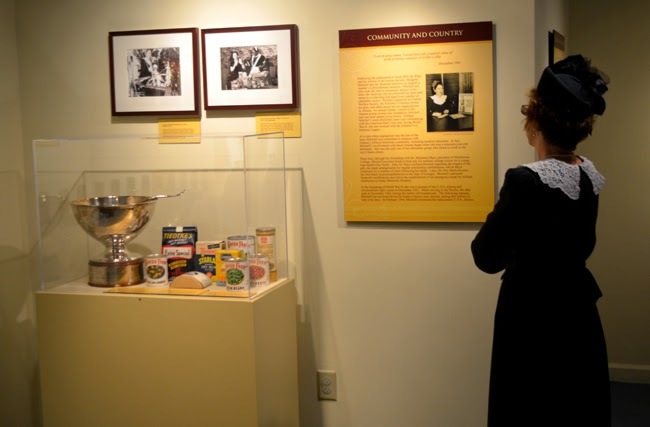 The Margaret Mitchell Exhibit is in the Special Collections on the 5th Floor. There are other reasons to go to Central Library as a tourist. There are special exhibits, seemingly all the time and not just on the 5th Floor. The last time I went—actually to see the Margaret Mitchell Exhibit when writing about the Gone With the Wind Trail—I happened upon two restored chariots from the movie Ben Hur on the entry level. You just never know what you're going to see in Atlanta! 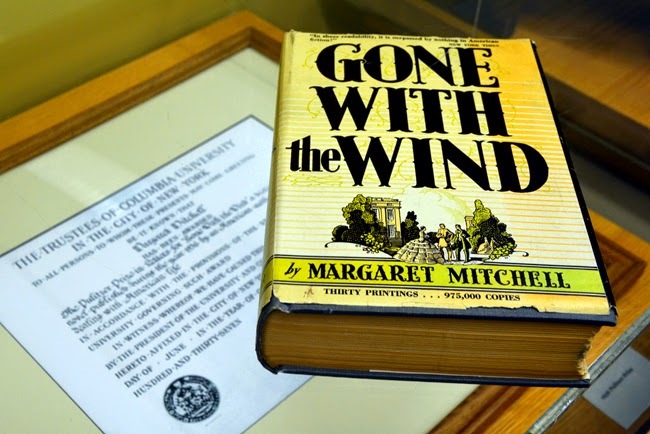 Kelly, our tour guide at Central Library, pulled out some not-on-display artifacts, including a first edition copy of Gone With the Wind that belonged to Margaret Mitchell, and the one millionth copy, presented to her by publisher Macmillan. She let us make photos—non-flash, of course—of the books. The photo above I shot with Margaret Mitchell's Pulitzer Prize. Photos of the exhibit are permitted and Kelly told us that the exhibit will soon be redesigned to feature more of the film. Atlanta Movie Tours' tagline reads, "Hollywood is closer than you think," and that couldn't be more true. In the case of this particular tour, they could also say, "Broadway is closer than you think." I believe you'll agree that this tour is Tony Award-worthy. And you'll quickly become an enthusiastic fan of Sally, the 'actor' who portrays Margaret Mitchell. She's also a docent at Oakland Cemetery. One word of advice...when meeting at Atlanta Movie Tours headquarters, pay attention to where you're going. I walked right by it totally fixated on a large zombie sock monkey in the storefront window! 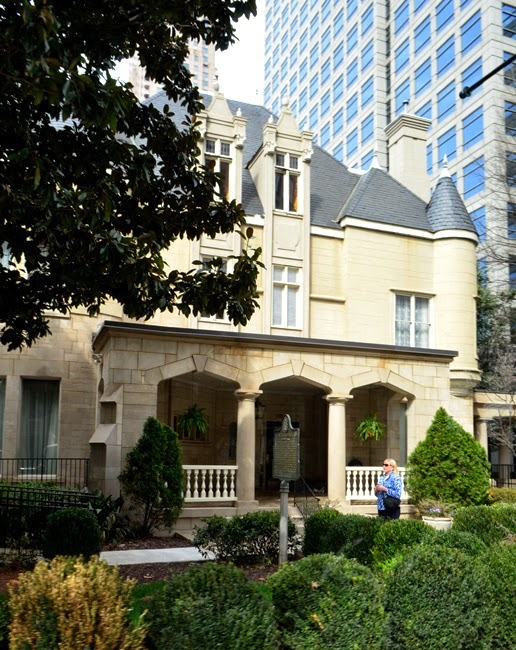 "Thank you" to Atlanta Movie Tours and to Patti Davis, co-founder and co-owner of Atlanta Movie Tours, for inviting wanderlust ATLANTA to experience their new tour. It's beyond brilliant...the best tour I've been on in years! I've gone on and on, but rest assured that what I've shared is merely the tip of the iceberg...wait, wait, that's a different movie...rest assured that what I've shared about Atlanta Movie Tours' newest venture is merely a single radish of the bounty of Margaret Mitchell's Gone With the Wind Tour. You'll never be hungry again for knowledge of Margaret Mitchell's life. Read the Book - it is soooo much better than the movie (if that's possible). It took me (an ADHD non-reader) a while to get thru it but I'm so glad I did. I have a better appreciation for the South, Atlanta and her citizens, and their struggles to come to terms with first a war and then reconstruction - the new South. I took my cousin from Alberta, Canada to "the Dump" (ashamed to say a lifelong citizen of Atlanta and had never been - UGH) - it was one of the best historic tours I've ever been on. Learned so much about Ms. Mitchell's life, which was so much more than just Gone With the Wind !!! Well worth the time and money !! Wonderful to hear that you visited the Margaret Mitchell House ("The Dump"). She truly was an amazing, fascinating human being. So sad she died so young. Knowing some of the things she did behind the scenes, there's no telling what she could/would have accomplished had she lived another 40+ years!